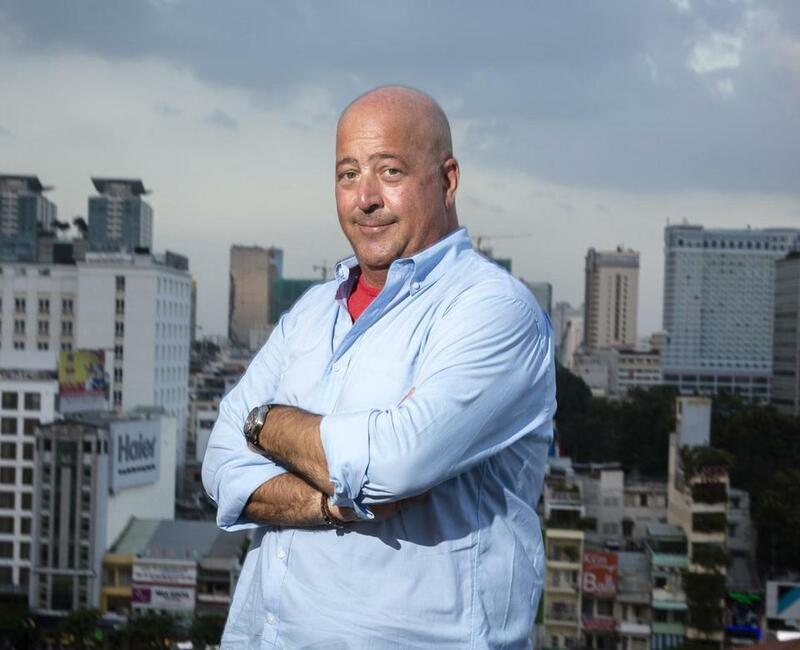 Andrew Zimmern recommends the baked beans at Durgin-Park. Baked beans in the oven at Durgin-Park. The 53-year-old Minnesota-based host describes “Bizarre Foods” as using unusual foods and travel in far-flung corners of the world as a way of connecting people and preaching “patience, tolerance, and understanding.” He sees the new show as having a somewhat different focus. “A lot of conversations about food and travel start with “What should I make sure to eat while I’m there?” he says. So the idea was to make a show that was purely about recommendations, that takes viewers to different cities and shows them not necessarily the best food in town, but the dishes that you have to eat before you leave. Along with stops in New Orleans, Hong Kong, and Paris, the series visits Boston, where Zimmern samples clam chowder at Union Oyster House and baked beans at Durgin-Park. Not a live eel or fried insect in sight. A. Webster’s defines bizarre as special and unusual and having unique characteristics. It doesn’t have any of the pejorative connotation that it has developed as a colloquial term. Q. How did you choose foods and restaurants for the Boston episode? A. We tried to pick places that are doing that dish well. There are a million places to have a broiled piece of scrod in Boston, but Legal Sea Foods’ version is a classic. You can go to the supermarket and get chocolate-chip cookies, but the Cookie Monstah truck is a fun, great way to have a hot, homemade Toll House cookie. The Parker House still sells more Boston cream pies and more Parker House rolls than anywhere. Q. Why are these classics important? A. There’s something fun for me as a culture geek to be in an environment where the whole thing started. Just like I like to go to a restaurant for great service or ambiance, history and the ability to connect with cultures is really important to me. Union Oyster House is a great example of that. Do they have the best clam chowder in town? Absolutely not. Do I still go there and have clams on the half shell and eat a cup of chowder? You bet. I like to stand at the bar where Daniel Webster sucked down oysters and clams. I want to breathe the same air that people have been living and breathing in that place for hundreds of years. Q. You visit Durgin-Park for baked beans, but that’s something many Bostonians have never done. A. I don’t think it’s important for Bostonians to eat baked beans. I think for Bostonians, their heritage, the Yankee spirit, the food that you grew up on — I mean that generationally, not literally — are all in the DNA. You don’t need to eat it. For visitors, it’s really important to go down to Faneuil Hall and have a bowl of baked beans. Q. Do you ever come to Boston when you’re not filming? A. I spend a lot of time in the city and my father lives nearby. At one point, we were going to move there. I lived in Boston for a year during my college days and it’s always been a very special second home city to me. I’m also the entrepreneur-in-residence at Babson College, another thing that brings me to Boston several times a year. I teach entrepreneurship through The Lewis Institute. Q. When did you live here? A. I took a year off from school and actually worked at the Harvard Bookstore Cafe. I did a stage [kitchen apprenticeship] and worked for three weeks down the street at L’Espalier. I took summer school classes at Harvard in design and illustration because I thought it would help with my cooking. I ended up staying for a year and working at restaurants around town. Q. When you’re not filming, where do you eat? A. I never miss an opportunity to eat at one of Ken [Oringer] and Jamie’s [Bissonnette] places, or one of Barbara Lynch’s places. I do a lot of ethnic dining. I love running in to grab a bowl of live shrimp at Jumbo Seafood. I love sitting at the Island Creek guys’ new oyster bar. I love going up to the Cambodian restaurants just outside of town. I don’t think there’s a time when I’m in Boston that I don’t drive into the North End, double park, and grab some cannoli and sfogliatelle from Maria’s Pastry Shop and some meat and cheese and olive oil and bread from Salumeria Italiana and eat it in the car. The Boston episode of “Bizarre Foods: Delicious Destinations” airs at 9 p.m. on Feb. 9 on the Travel Channel. Interview has been edited and condensed. Michael Floreak can be reached at michaelfloreak@gmail.com.